October 13 - "Soles to the Polls"
Teaching and informing citizens about important civic issues, and providing nonpartisan information on candidates and policies prior to an election are top priorities for the Duluth League. Each election year the LWV Duluth distributes over 5,000 voter guides, recruits poll monitors, carries out extensive voter registration efforts, broadcast the “Get Out the Vote” over radio, TV, Internet, and print media, issues voter information cards and bookmarks, hosts an election day hotline, and holds forums where ideas & views on issues are exchanged in balanced debate. 2011 Immigration Series: (8 separate events) focusing on themes relating to possibilities & challenges of immigration. 2007 Earth Day booth at the Watershed Festival. League of Women Voters is a member of the Healing Our Waters, Great Lakes Coalition (HOW) and partners with other coalition members to advance restoration goals and assist as advocates in public outreach and hosting conferences. 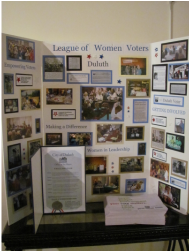 LWV Duluth annually holds an event to commemorate Women’s History Month and Black History Month - showing a variety of inspirational films like “Not for Ourselves Alone”, “Iron Jawed Angels,” “Willmar 8” and also participates in observances at both UMD and St. Scholastica. 2007 We celebrated Women’s Equality Day by distributing bookmarks and information. October 2007 The League began working on a study of Duluth Infrastructure systems. The study took two years to complete during which time the League monitored issues, collected data and met with government officials using a non-partisan fact-finding process with the eventual goal to take action to educate & influence public affairs to make a difference in our community, May 4, 2010 the League Consensus on this issue and took a position which is discussed in more detail elsewhere on this website. Leaders of Today and Tomorrow (LOTT): LWV Duluth sponsors candidates for this conference. Candidates are young college aged women who are interested in active citizen involvement in either government policy or possible government careers. The LWV Duluth hosts Humphrey Institute International Fellows who come here to learn more about our city and it’s government. The fellows meet with local officials and agencies and observe the day-to-day operations of the civic systems. 2009 Fellow were from Colombia & Brazil. 2007 International Relations: LWV Duluth representative, Joyce Benson went to Petrosavask, Russia and met with the Russian League of Women Voters President about how to do candidate forums. 2008 Our International Relations committee received an Open World Grant to host 6 participants and 1 coordinator from the country of Tajikistan.